I’ve always said NYC is the fashion show that never ends. Radiant street style is abundant everywhere you look, outlined by the most beautiful city skyline. 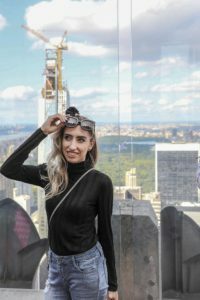 With so much to see and do, I wanted to be sure my energy was spent exploring, and not having to think so hard about what to wear. I made sure to bring some #nycvibes back home to Milwaukee. Here are my top 4 NYC Staple Pieces. Interested in an item? Just click the photo to be directed to the style!! I have to be honest. I loved this top so much that I went back and bought it in green. Hear that everyone?? 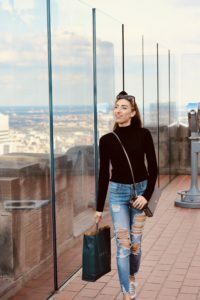 The turtleneck is BACK and here to stay! Easily style this top with a pair of jeans, paper bag pants, ankle pants, high waisted shorts…Yes, practically any bottom will compliment this top. Versatile in all seasons, this top easily constitutes itself as a #staple. I will admit, I was also tempted to buy it in burgundy, because that would have looked bomb with burgundy lipstick. Darn it. Actually, I still might do it. 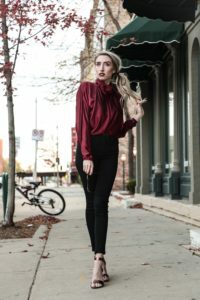 I have been on the market for a silky maroon blouse for a LONG time, and I finally found the PERFECT ONE. The color of this top is so rich looking. The fabric is super light, and has this subtly sophisticated shine to it. It is soooo comfortable and the fabric magically seems to fall perfectly no matter what. For me, when it comes to staple pieces that are going to be in my wardrobe for a while, they must be versatile. Dress this top up with a black pencil skirt and heels, or tuck it into some distressed denim and ankle boots for a classy n’ chill vibe. The classic black cocktail dress is the epitome of “Staple Piece”. Black cocktail dresses will never go out of style, and can be worn with pretty much any type of coat or jacket. This makes them perfect for Runway Auditions, or Comp Card Photo Shoots! Plus, they are great to be worn all year round. Because I wear them so often, I am sure to replace them every couple years or so as color tends to fade. Make sure your black dresses are still black. If your black cocktail dresses aren’t looking so crisp, it may be time for an upgrade! I found this dress in NYC at a boutique called Strawberry. Their prices are amazing, but they don’t have an online store!! I’ve linked a similar option in the first two photos of this dress to a comparable dress from Nordstrom. I’m thinking of posting a blog about a variety ways to style a simple black dress…let me know what you think!! The silk blouse is such a beautiful color on you – that one’s my favorite! 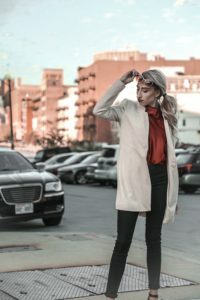 I love this jacket that you are wearing at the end! And your photos make miss miss NYC! Thanks, Chelsea! it’s my favorite jacket I own now 🙂 Definitely get back to NYC when you get the chance! I love all of these pieces, but wow, that blouse! The color is so rich and it looks so luxe!